There is thin line between a muffin and a cup cake. Traditionally, cupcakes were simply miniature cakes, light and sweet with fluffs of frosting on top. Muffins, on the other hand, were more dense, usually made with heavier ingredients such as bran, oats, dried fruit and nuts. Today, the once lowly muffin has been elevated to superstar status, and can be spotted draped in frostings, glazes, and fruit compotes. 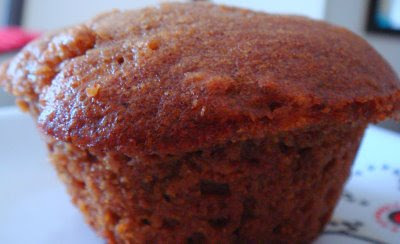 Its texture is also becoming lighter and sweeter like its cupcake cousins. Sometimes it can be difficult to separate the two. Not that I'm complaining. Muffins with frosting, cupcakes with fruit and nuts, cupcakes with muffin tops. To me, they are all small parcels of goodness. If prepared with a mind towards good healthfulness, muffins, and even cupcakes, can be a clever vehicle for so many nutritious and wholesome ingredients. For this recipe, I chose the traditional route with tons of dried apricots, chunks of apples and wholesome oats. Such as easy and delicious way to incorporate extra fiber into your diet. 1. Set oven to 350 degrees F. Spray muffin tins with cooking spray and set aside. Dust fruit with reserved 2 tablespoons of flour and set aside. 2. Combine whole wheat flour, white flour, oats, baking powder, baking soda, salt, cinnamon, ginger and nutmeg. Set aside. 3. In a large mixing bowl, whisk together half and half, yogurt, and sparkling water. Add sugar, honey and vanilla extract and whisk well until sugar is completely dissolved. Whisk in egg. 3. Add flour mixture to sugar mixture and fold until just combined. (Usually requires about 10 to 12 folds.) Gently fold in fruit. 4. Using a 2 inch ice cream scoop, scoop batter into muffin tins. Bake for 20 minutes until muffins spring back to your touch. Remove from tins, and cool completely on a wire rack. Note: For muffins, I prefer to use fat free Icelandic yogurt because, so far, it is the creamiest fat free yogurt I have food on the market. (Icelandic yogurt is strained to produce this thickness and creaminess.) Regular, commercial fat free yogurt has a greater water content that interferes with the liquid measurements in this recipe.